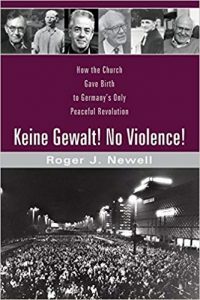 Review of Roger J. Newell, Keine Gewalt! No Violence! How the Church Gave Birth to Germany’s Only Peaceful Revolution (Wipf & Stock, 2017), 212 pp. ISBN 978-1-5326-1282-4. The origins of Roger Newell’s book lie in a study tour to the Nikolaikirche in Leipzig some years after the tumultuous events of 1989. But the book also represents a sensitive discussion of the many strands of argument and interpretation which have emerged across the English-speaking world in response to the tides of German history across the twentieth century. In such a meeting of personal and academic dimensions does Keine Gewalt! offer something of a personal odyssey as well as an exploration of the continuing themes of Church and State, theology and society, conformity and revolution in modern Europe and beyond. The fundamental question is never far from view: how might a church that was so effectively marginalised by a dictatorial power after 1945 become a focal point, and a catalyst, for a great movement of peaceful change across the whole of the German Democratic Republic? This sense of observing and interpreting like a guest whose eyes are being opened by degrees to something new and unexpected is certainly one of the strengths of the book. It makes Newell himself something of a tourist – in the best sense – and equally an attractive introducer to readers coming to the same questions afresh. The vital presence at the heart of the story is the pastor of the Nikolaikirche himself, Christian Führer, who in 1989 opened the doors of the church to all people – and, in particular, to many who were disaffected by the Communist state – so that they could meet together, light candles, share what was important to them all and find new ways to insist upon these things in a world of repression and intimidation. What were the roots of such a ministry and the historical and theological context in which such a moment lay? In a remark to Newell, mediated through his wife, Monika, Führer himself replied that much could be comprehended in the three names of Dietrich Bonhoeffer, Martin Niemöller, and Karl Barth. It was here that German Protestantism found an accumulating tradition of theological understanding which was rich enough to bear fruit in a new context and age. Was the Nikolaikirche at last a realisation of Dietrich Bonhoeffer’s vision of a Church that existed for others? But, as Newell finds, this is no simple inheritance and there were others who played their part in this accumulating history of ideas and experiences, particularly Albrecht Schönherr, Helmut Thielicke, Heino Falcke and Barth’s protesting adversary, Emil Brunner. He views them squarely in turn, and often sympathetically, even where doubts are obvious. To be sure, there are few villains in this book and no grinding axes – and it is all the better for it. The eirenic tone never falters. The structure of the book responds to this agenda, offering chapters first on Bonhoeffer and then Niemöller before concentrating much attention on Barth in successive phases of his life and thought. Barth, indeed, provides a cantus firmus for the whole study, moving restlessly through the foreground or background, first of National Socialism and the Barmen Declaration, then the post-war crisis and the Stuttgart Declaration and the Darmstadt conference of 1947, and then the deepening confrontations of the Cold War and the troubled (and troubling) search for a ‘third way’ between the worldly powers of Communism and Anti-Communism. It is the two final chapters which confront the peaceful revolution itself, an escalation of principled protest and public mobilization and a deterioration of political will culminating in the disastrously misfiring fortieth anniversary of the foundation of the GDR on 7 October 1989. If pastors like Führer had once brought the people from the street into the sanctuary, now they all took to the streets clasping their candles, returning violence with piety and securing an unexpected revolution which would transform a continent. ‘We were ready for everything except prayers and candles’, reflects a rueful President of the People’s Chamber, Horst Sindermann. The story still possesses the power to move, however much it may have been trimmed, qualified and modified by sober analysis and argument. There are many fine qualities to admire in this book, but in its blending of undemonstrative curiosity, personal idealism and uncomplicated intellectual honesty it presents an admirable model of a kind.